20 minute sessions run from 3-6:00pm, Saturday Dec. 8th, 2018. Experience the thrill of using your own breath to blow a one of a kind tree ornament or sun catcher ball! 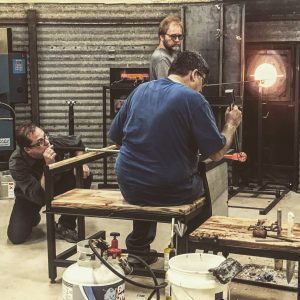 Register for a 20 minute session time slot in the New Glassworks Silo at the Art Center. All supplies are provided, and closed toe shoes are required. Ages 14 and Up are welcome. Anyone under 18 must be accompanied by a parent, and sign a waiver.